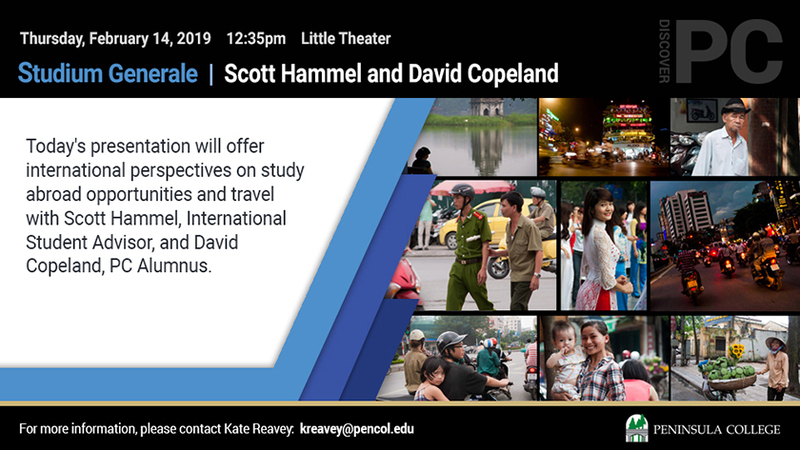 On Thursday, February 14, the Studium Generale series welcomes Scott Hammel and David Copeland for a presentation titled “The Importance of International Perspectives (and Opportunities to Acquire One)” at 12:35 pm in the Little Theater at Peninsula College. The International Student Advisor at Peninsula College, Hammel worked in education in Asia from 1995 to 2012. He spent the first 15 years in South Korea and spent his final two years in Vietnam before returning home to advise international students in the U.S. He will be sharing anecdotes and slides from his experience in Vietnam that reflect the broadening and maturation of his view of the world. Hammel completed his BA at Eastern Washington University. Copeland is a Peninsula College alumnus who recently graduated with a BA in Political Economy. He was a Department of State Gilman Scholarship recipient, which he used to complete his final 10 credits at Humboldt University in Berlin, Germany. Copeland will talk about his experience in Germany, how it has been helpful to him, and how current students at Peninsula College can take advantage of the Gilman Scholarship. For more information contact Dr. Janet Lucas at jlucas@pencol.edu.